Service Costs > How Much Does AAA Battery Service Cost? How Much Does AAA Battery Service Cost? 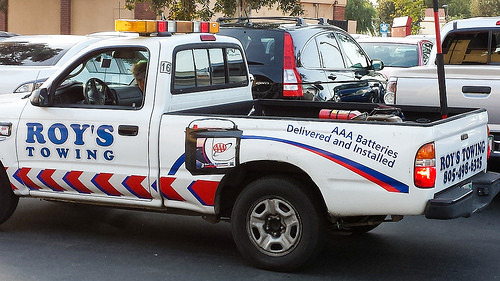 AAA battery service, one of the many services offered if you are a member of AAA, will send out a professional to replace your old car battery if it were to fail. How much does mobile AAA battery replacement service cost? If your battery is just dead and needs to be jumped, this should not cost you anything as long as you are a member of AAA. However, if you need a completely new battery, AAA will offer to bring you or sell you a competitively priced battery. In most cases, the cost of a car battery through AAA’s service is going to depend on the year, make and model of your car. Based on a few vehicles on the official AAA website, the cost of their battery service is going to range anywhere from $100 to $160. Non-members will have to pay $25 more. To get an exact quote for your battery, refer to this AAA quote page. According to Elise.com, the author claimed that she received a quote for $112. Since she felt the price was too high, she received a second opinion at Sears, who stated that the battery was perfectly fine. When an AAA professional is sent out to your car, they will first test the battery to see if it needs to be replaced or if it needs a simple boost. If the battery only needs a boost, they will jump your car; however, if the battery is dead, they will install and deliver a new AAA-branded battery. The old battery will be disposed of and recycled free of charge. Every battery that is replaced with AAA will have a six-year warranty with a three-year replacement. If the car needs more than a battery, additional service charges may apply. For example, some people think the battery is the problem when it really is something else like a starter. If this were the case, a tow truck may be needed. If you need a new battery but choose not to have AAA install their branded battery at the site of the car, you may have to get your car towed to a local auto repair shop to have it fixed. This would mean that you have to pay for the services of a tow truck. All things considered, the price of the AAA branded battery will probably be worth it, even if it is slightly higher than another brand because it will save you time and hassle. Battery replacement by AAA is only available in certain metropolitan areas. When you need a battery, simply call up your toll-free number and request service. If you have the premium AAA service, you can send them your address by the simple click of a button on your phone or iPad. Your location will be sent to them automatically. Non-members will have to pay $25 more than a member. If you are not a member of the club and plan on using their roadside services, you may want to consider joining. A battery may not be required. Before they send out a new battery, they will test the old one to see if it just needs a jump. If you can have someone pick you up, consider going to a local auto parts store to buy your battery. Replacing an older battery is a lot easier than you think and can even save you a few dollars. Remember, whenever you use a roadside assistance service, you are paying a premium to use the services. Depending on the battery, some may include a small $10 recycling credit. Since the AAA battery prices can be high, consider having them jump your car and head to a local auto shop to have your battery checked a second time. Some conflicting stories on the Internet have stated that sometimes AAA said the battery was in need of replacement while other auto part stores said the battery was fine. If you have the time, it does not hurt to get a second opinion.